Elisa Lorello’s lifelong love affair with Duran Duran began like that of many other fans: staying up late watching MTV, plastering her bedroom walls with glossy posters and magazine pinups, and writing secret stories about someday becoming Mrs. John Taylor. But waiting in the darkness was a life that held more than she bargained for. Battling a negative self-image, self-imposed isolation, and troubled relationships, Elisa eventually unlocked the strength to free her and become the teacher and bestselling novelist she was meant to be. And she discovered that her Duran Duran fandom—and the power of music—was the key. Using her signature blend of humor and heartstring tugging, Elisa transports readers back to a time of synthesizers and shoulder pads, fedoras and Ferris Bueller, leather pants and Live Aid. Much more than a fan letter, Friends of Mine: Thirty Years in the Life of a Duran Duran Fan is a collection of stories about growing up in 1980s suburbia. It’s about first loves, first losses, divorce, Generation X, family, and friendship—all set to the soundtrack of the original Fab Five. I received this surprise days after my 44th birthday -- what a fantastic present. 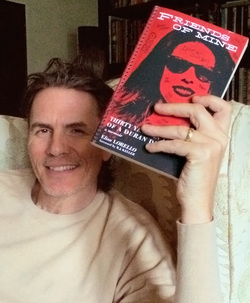 John Taylor, from Duran Duran, holding my book (it's the copy I presented to him)! The reliable source also told me that JT "loves the cover" and was "happy to oblige" this snapshot. I'm incredibly grateful to him for doing so. Looks rather swell in his hand.